There hasn’t been a week during this first year as an SLP that I haven’t turned to pages in this book with an unmistakable urge to hunt down the authors and hug them forever. Secord, W. A., Boyce, S. E., Donahue, J. S., Fox, R. A., & Shine, R. E. (2007). 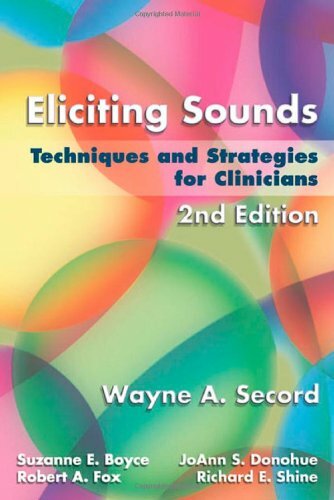 Eliciting sounds: Techniques and strategies for clinicians [spiral bound]. Clifton Park, NY: Thomson Delmar Learning. It runs about $50-$70. When I first bought this book, it didn’t feel important. It was almost like a leaflet you might pick up at a doctor’s office. Like an adult “Highlights Magazine”, except more expensive. Now days, it holds an esteemed place of honor in my top right hand drawer. Easily accessible. Always nearby. I would pay $100 for this gem. I’m hoping this book is a standard required reading source in SLP grad school. If not, then buy it. You won’t regret it. Totally agree. This book was a life saver when I was in my public schools practicum!